The staff members at the Philippine Consul General’s Office in San Francisco are very good in making sure that the Filipino American media is updated with consulate-supported events and activities. Consul General Marciano Paynor (an adopted son of Cebu) wanted to be sure I would be at one of the latest media briefings but I am so sorry, Amba, I was stuck somewhere in San Jose, wilting under the Indian Summer’s rays of the sun, yet engaged in an interesting conversation with Jasjeet Singh of World Sikh News and Amritsar Times… Surely, as a community publicist (ok, a volunteer community publicist who takes the time to promote non-profit projects that make the Filipino community proud, yehey! ), I would keep hearing about really awesome undertakings that we have been waiting for in the past three years — or so. Yesterday, I received an email from an old friend. How have you been?? Hope all is well with you and your family. Im writing you from Manila. You must have heard about the soon-to-open new California Academy of Science at the Golden Gate Park featuring the Philippine Coral Reef as its permanent exhibit. Malou Babilonia heads the Filam Focus Group which supports it and Im in the Steering Committee with Tita M, Voltaire Guingab, Susan Po- Rufino, Nenuca Ortigas and others. Would you please help us spread the word about this great Philippine pride by forwarding these articles to your million and one Filam contacts and the movers and shakers from the East Coast to the West? Let me know of your great help so I can update Malou and the Focus group about your valued assistance which will surely make a lot of difference. Will forward you succeeding press releases as well. Can I count on you, my dear Lorna? So, Celia, here it is… Let’s start with a press release that you sent me. I can’t wait to see the wonderful photos! SAN FRANCISCO — The worldâ€™s deepest living coral reef exhibit opens at the new California Academy of Sciences in Golden Gate Park on September 27, 2008. The Philippine Coral Reef Exhibit, in a 212,000-gallon aquarium tank, will be home to a variety of soft and hard corals, black-tipped reef sharks, rays, and more than 4,000 reef fishes that are native to the Philippines. Visitors will be able to view the reef and its inhabitants from the surface as well as from five different underwater windows. The Academy chose to feature a Philippine coral reef because the reef systems in the Philippines are among the most diverse in the world. Despite their global importance, most people on the planet have never seen a living reef. With the opening of the new Academy building, over a million visitors a year will be able to experience the splendor of a living Philippine coral reef and learn what they can do to help save coral reefs around the world. With a 40-year history of research in the Philippines, resulting in the discovery of dozens of new animal species and publication of a comprehensive guidebook to Indo-Pacific invertebrates, the Academy is partnering with local education and conservation groups, such as Pusod, a non-governmental organization based in the Philippines and Berkeley, whose mission is to preserve and enhance the ecosystems of the Philippines and show their significance to the world. Both organizations are committed to scientific, educational, and outreach efforts regarding the coral reefs of the Philippines. These efforts will be targeted toward the Filipino community in the Bay Area and abroad, fostering their appreciation for and personal connection to one of the world’s critical biodiversity hotspots. The Academy and Pusod have organized a group of San Francisco Bay Area Filipino Americans to generate interest and excitement about the exhibit, and to get the Filipino community involved. The group, Reaching out through Environmental Education to Filipinos (REEF), has a marketing team that has been aggressively promoting the exhibit to different sectors of the Filipino community. Recently, it participated in the Pistahan parade in San Francisco with a marine-themed float. Dr. Meg Burke, the Academyâ€™s Director of Education, comments that it is wonderful how the Filipino community has been so cooperative and excited about the Philippine Coral Reef Exhibit. She says she is overwhelmed by how much support the Academy has received from the Filipino community in making the exhibit a spectacular possibility. Me and my big mouth! The persevering and tenacious Elton Lugay, one of the co-founders of the Ginoong Pilipinas-USA pageant/competition, and I were having an intense discussion about the portrayal of young Filipino male pageant candidates as men who dare to assert their empowerment goals in a pop culture event. Elton was very excited about their first Los Angeles event (after four years in the San Francisco Bay Area and one year in New York City) for July 20, 2008 at the Radisson Hotel Los Angeles Midtown at the University of Southern California, located at 3540 South Figueroa St, Los Angeles CA 90007. He explained to me that California State Senator Leland Yee’s advocacy, the White Ribbon Campaign, a worldwide campaign of men working to end men’s violence against women, is one of the primary beneficiaries of the event’s proceeds. “Because you’re going to host the interview portion of the program,” Elton declared. “Moi? I write profiles, Elton,” I protested. “But you interview people, right? What’s the difference?” Elton asked, determined not to get a “No!” for an answer. “OK, this is my personal support for you, Elton, as a Filipina who wants to end violence against women and girls,” I agreed, not sure why he thought I was an ideal pageant interviewer. 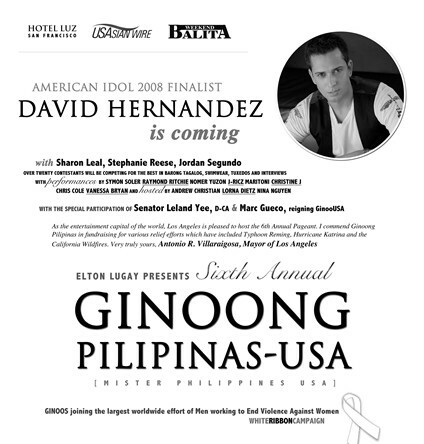 If you’re in the Los Angeles area on Sunday, July 20, 2008, please come and celebrate with us as Filipino men “break stereotypes” at the 6th Annual Ginoong Pilipinas-USA [Mister Philippines USA] competition. At around 6:30 p.m. on March 29, 2008, I took a SuperShuttle from the Los Angeles International Airport to attend a book launching at Remy’s On Temple, smack in the middle of Historic Filipinotown. My friends, all Filipinas from Cebu who are the editors of BisayaBulletin.com, had helped organize this successful event. Who would greet me at the doorway of this art gallery if no other than the great Benito Miranda himself, the Territory Manager of Secure Horizons (by UnitedHealthCare)? If Benito isn’t busy “pushing” value-added Medicare plans and options, he networks in the golf course and at events (yeah, I still remember meeting him for the first time at a Filipinas Magazine Achievement Awards event a few years ago). 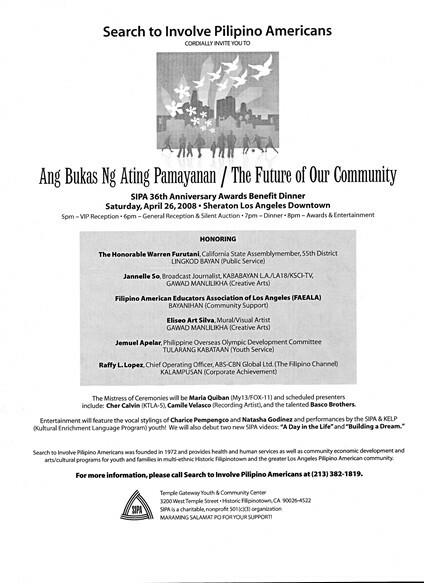 As one of Search to Involve Pilipino Americans’ (SIPA) board members and SIPA’s Past Board President, Benito made sure all of his friends knew about SIPA’s 36th Anniversary Awards Benefit Dinner on April 26, 2008. He is relentless, this Cebuano! And since we know that this is a worthwhile cause, we just need to spread the word! Well, Benito Miranda, you got your wish! Just make sure you show up at our October 2, 2008 Filipinas Magazine Achievement Awards event at the South San Francisco Conference Center, ok?